-51% OFF on This Outfit : Today Only! Want to buy a leather jacket? Just go to Leather Jacket Black and select Men Classic Leather Jackets Smooth. We have a cluster of satisfied customers which are true evidence of our services in the leather market. Men Classic Leather Jackets Smooth is made up of PU leather which is considered as best quality leather in the market. PU leather is surely one sort of fake leather-based. Polyurethane leather fabric is faux leather-based made from high fine plastic substances, for you to be an awful lot inexpensive than actual animal leather. This jacket has viscose lining inside the jacket. Viscose is a fabric that is commonly used in coats, jackets, sweaters etc to insulate your body and keep it warm. 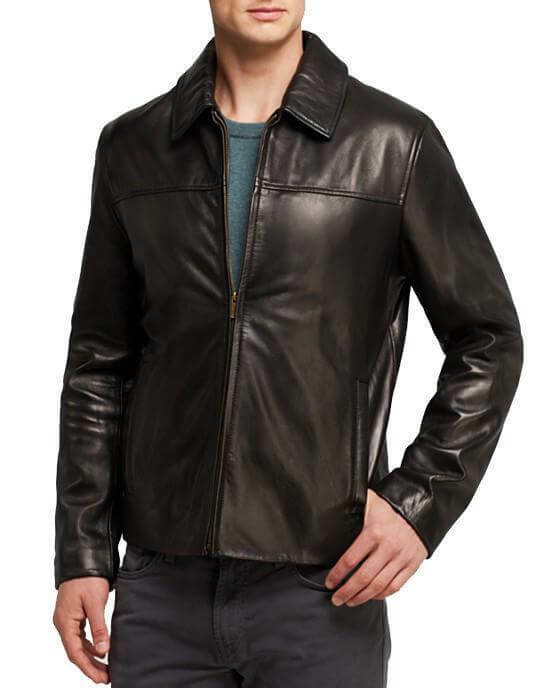 Men Classic Leather Jackets Smooth has front zipper closure due to which it fits well on the body. This jacket has two outside pockets. It has open hem cuffs. The stand-up collar of this Leather Jackets Smooth adds beauty to its charm. Pair it with blue jeans it will provide you a macho look in any kind of gathering. You can use this jacket with any pair. Men Classic Leather Jackets Smooth has black color. Awesome, perfect fit and super warm!!! Just what I was looking for and the price was reasonable. I had to update this review as the hem came out of the bottom of the jacket after my second week of wear. This jacket is very nice, my only real complaint is that has no wind breaking material so you still get chilly on windy days. But it’s comfortable, soft and fits great!